IN JAPAN, NATURE IS DIVINE. GET OUT OF THE URBAN JUNGLE AND SEE THESE NATURAL WONDERS. For a country with a landmass one twentieth the size of Australia and a population five times larger, Japan has a fascinating relationship with nature. This relationship dates back centuries to Japan’s indigenous religion, Shintoism. At the heart of Shinto are Kami, powerful spirits that bring nature to life. In Japan, nature is divine, and in its simplest form the Shinto faith cherishes and worships nature. 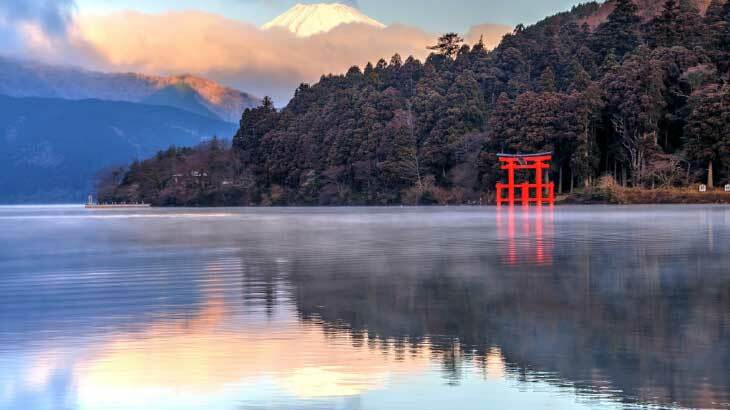 From the majestic waters of the Fuji Five Lakes, to Snow Monkeys in Takayama – Japan offers the opportunity to appreciate her quietly beautiful natural secrets. 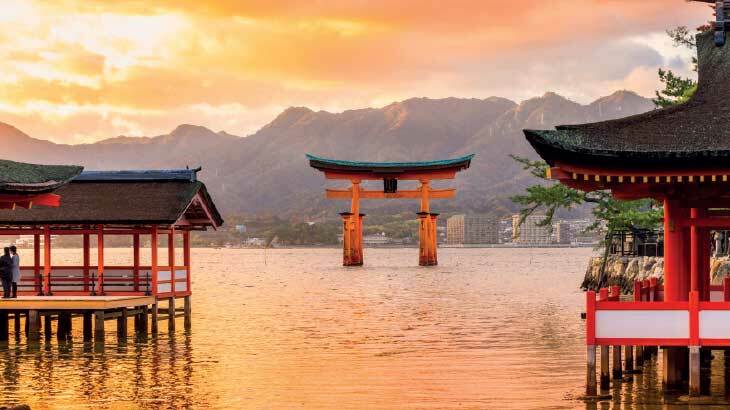 The picturesque island of Miyajima, south of Hiroshima is home to gods and deer as well as the leafy Mt Misen, boasting one of the best-preserved forests in Japan. The islands tallest mountain is a vibrant habitat for Japanese Macaques, Deer and Tanuki (an adorable Raccoon/dog hybrid) unique to Japan. Because of this, the ecology of the island, from the surrounding ocean to the mountain tops is considered an archetypal model of Japan. Leisurely strolling the island is the best way to take in the stunning natural beauty. To top it off, Miyajima is home to the famous floating Tori shrine. See it on: JEWELS OF JAPAN. 12 DAYS. 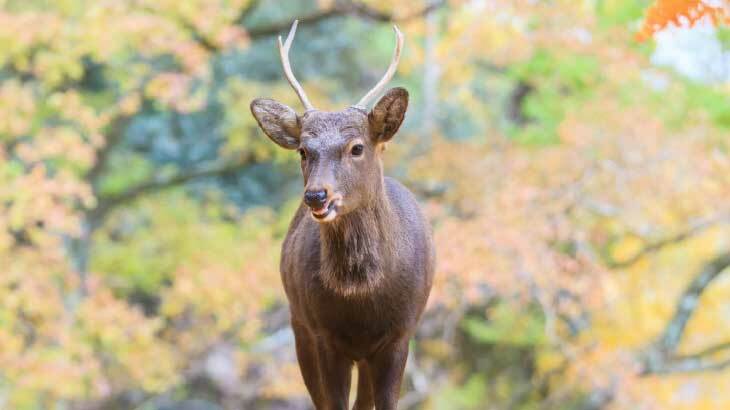 Founded in 1880 at the base of Mount Wakaksu is the 1200-hectare Nara Park, where more than 1200 wild Sika deer roam. For the Shinto faith Nara Park has long been an important place of worship and is home to the Todai-ji, Kofuku-ji and Kasuga shrine. Even today, deer have free reign over the city and are very comfortable among humans. Because of this they have an enduring bond with the park and are deeply revered in Japanese culture that they have been officially classified as a national treasure. See them on: A WEEK IN JAPAN. 9 DAYS. 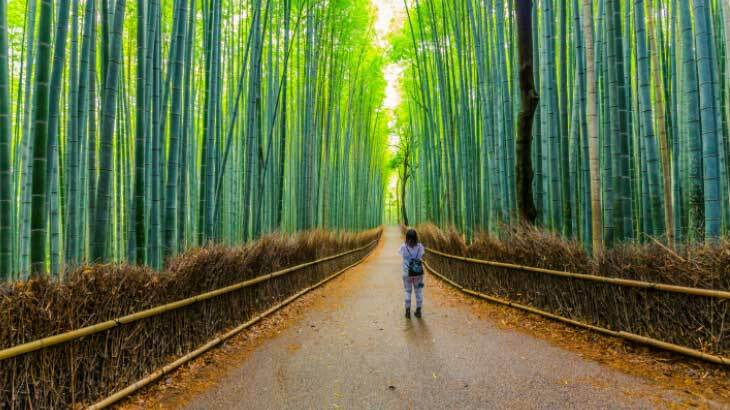 On the outskirts of Kyoto lies the glorious Arashiyama Bamboo Forest. The dense bamboo forest borders the historic town of Arashiyama and sits against a backdrop of Arashiyama Mountain, a habitat for a troop of more than 170 Japanese macaques. Here you can feel an intimate connection with the surrounding environment as the forest walkways create a surreal atmosphere. The bamboo grove has a spiritual function in that the bamboo is considered sacred and used to protect the nearby Shinto shrines from evil spirits. See it on: TRAILS OF JAPAN. 14 DAYS. As the name suggests, the area at the base of Mount Fuji contains five breathtaking lakes formed by previous Mount Fuji eruptions. 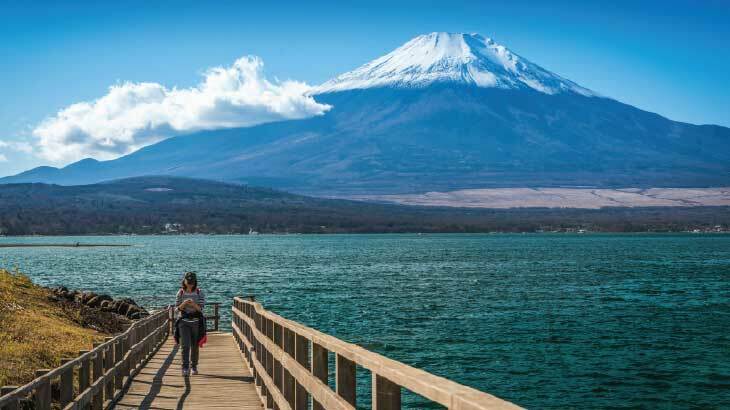 The Fuji Five Lakes area is a popular weekend getaway for people from the big cities and is renowned for its natural beauty, hot springs and outdoor activities. Cruise along the Fuji Five Lakes and soak up the serenity of the mountainscape, visit Oshino Hakkai to see a collection of eight crystal clear ponds formed by the melting snow of Mount Fuji. In the Fuji Five Lakes region the water is so pristine that you can see Mount Fuji and the surrounding landscape reflected on the surface of the ponds. 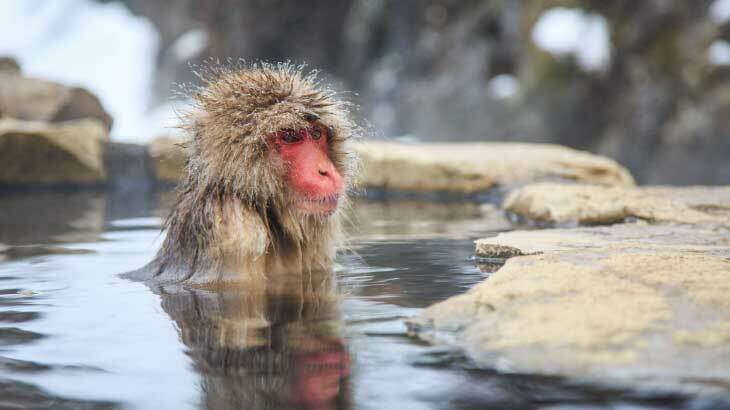 Located north from Tokyo in Joshinetsu-Kogen National Park is a snow monkey’s paradise. Known by ancient Japanese as ‘Hell Valley’ for its unforgiving landscapes, Jigokudani is covered in snow for most of the year. Jigokudani sits eight hundred and fifty metres above sea level, and the snow falls over one metre thick. Jigokudani valley is one of the few places in the world where visitors can observe these social animals in their natural environment. Walking through a picturesque forested valley, you will reach the steaming hot pools where the beautiful Japanese Macaques, or snow monkeys bathe and play in the waters. See them on: SAPPORO AND SNOW MONKEYS. 13 DAYS. Lake Ashi is in Hakone National Park, the most visited national park in Japan, only a short distance from Tokyo. Formed three-thousand years ago at the last eruption of Mount Fuji, Lake Ashi is an iconic symbol of Hakone. While there are several towns and villages along its banks, for the most part the area is undeveloped. Highlights of Lake Ashi include the spectacular panoramic views of Mount Fuji and the volcanic, gaseous Owakudani Valley, where locals boil black eggs in the sulphuric naturally hot springs. Interestingly, these eggs are said to extend your lifespan. See it on: JAPAN UNCOVERED. 18 DAYS.